The Stereogum comments section should really be its’ own website. Every Friday afternoon I look forward to their Week’s Best And Worst Comments feature. After reading their Premature Evaluation of The Strokes‘ latest Comedown Machine, I started to peruse the comments. When I was 20 deep, I had to turn back. It was starting to get too real, bringing back midnight memories of my 2011 obsession with the band and the press that endlessly followed them around. I will always hold The Strokes responsible for Is This It. And I will always compare all their records to it (we all do?) because I know they can do better. I always plan on being disappointed. During all the press that preceded Angles I spent time obsessing about the band (and hating Julian Casablancas – the greasy douchebag that he embodies fits too well with this whole story.) It was a leak-free record and all I could do was read and wait. SPIN put them on the cover with a terrific interview done by Sloan Crosley – remember? they used to have magazines! – and all the band could talk about was how much they hated each other. That they would record separately and send the tracking to Casablancas. The band’s website was a big countdown clock. And if all of this wasn’t enough, the hype for this record was a living breathing being in the bedroom next to me. Planet Earth’s biggest Strokes fan also happens to be my best friend from college and my roommate. “I realized that I’ve never loved anything as consistently as much as I’ve loved The Strokes. They’ve been my favorite band since I was 14.” For as little as I know about their full discography, Angeline and I can talk about The Strokes at length. She surprises me in her devotion and her undying love for the band. The Strokes are HER band. So right before Angles was coming out, hype for it was around every corner in my apartment. When the first single, “Under The Cover Of Darkness“, was released she played it endlessly. In fact, I just put the song on and within the first few chords, it struck a chord. MEMORIES. Memories of her singing along to the guitar chorus, memories of hearing it through the walls for days. When the album finally came out, it was everywhere. Any spare moment of hers was spent listening to the record. We talked about it over and over. The Strokes are a perfect kind of band. Their songs are meticulously constructed from the production to the songwriting, their releases planned to the T – just like Angeline. She is a woman of precision. The Strokes are her favorite band and they are the heavyweight contenders defining her musical identity. She is straightforward, just like their rock and roll. There is no time for uselessness, everything has a reason, a place, somewhere to belong. She isn’t a woman of excess. Direct and full of life, she’s just like The Strokes. And since I’ve known her, seven years and counting, I’ve always had a special relationship with this band I can’t ignore. With all that being said, I’ve had Comedown Machine for a few days. I kept forgetting to listen to it. I’ve been preoccupied with Waxahatchee (!! ), Colleen Green (!!!) and Starfucker. But now that it’s finally crossed my bloodstream, I have a feeling we’re about to spend a lot of time together. For the first time in a while, the band’s music might start consuming me more than their hype. It’s a great record: it’s full of good licks, better lyrics, beautiful production and song progression – within the track and as they’re arranged to be Comedown Machine. (Super highlight: “Welcome To Japan” [below].) It’s no Is This It but as a stand alone record, it’s damn good. When people talk about The Strokes, they are less likely to talk about The Strokes as a band and more likely to talk about them as if they were a weird piece of performance art. We talk about what they mean, what their music means in the past and what it means now. We think about what their fashions did to our fashion, the controversy of the band members and their relationships, their privilege as rich white boys raised in New York City and how they “revived” a breed of garage rock. And because Comedown Machine is their fifth of the famous five record RCA deal, it seems to be their last. Due out March 26th, Comedown Machine is full of double entendres: album opener “Tap Out” and the last two, “Happy Ending” (say no more/just get it all off your chest/shake it up/500,000 times/say no more/we don’t believe anything) and “Call It Fate Call It Karma” both seem to break their own fourth wall just like “Machu Picchu” did with – what seems to be an infamous line – “I’m putting your patience to the test.” Comedown Machine is a great record. And “Call It Fate Call It Karma” [below] is a lo-fi, reverb soaked two step of a bizarro-world Strokes. It sounds like goodbye. Assuming that these five records will remain the world’s only Strokes records, we have to be content with what they gave us. The Strokes are the perfect example of the love-hate relationship. We struggle to love this band while they challenge us song by song. We call on them for rock and roll and hate them when they can’t deliver. But we keep going back. We’ll always keep going back. Because it’s always worth it when that hook hits the brain. do you play any instruments? I assume not since you think “is this it?” is their best album. most strokes fans say the exact same thing, and guess what? most of them are not musicians. much of the frustration that comes with being in a world famous band is being subject to the demand for more music (whether contractually obligated or not). bands don’t want to play the same songs for 10 years. they want to evolve; make something new. angles is by far the most ‘fulfilled’ strokes album simply because it is the most different. it is what those 5 musicians really wanted to do. otherwise, they could have easily fed those poppy, straight-forward rock songs from their first 2 albums right back to you because they’re classically trained musicians (nick excluded) who can poop out whatever they so plea (think about it). there is so much that goes into making an album and even more that goes into making the music that you want to make. “but they didn’t cater to me!” you and so many others who over-glorify the early work of ANY band are part of the reason why real musicians (i.e. The Strokes) find it so hard to explore, adapt, and recreate themselves the further they get into their careers. (this may be a big part of the reason why so many bands break-up, develop bad working relationships, etc.) stop hating on the strokes for not making another “is this it?” one is enough. two is excessive. no band really wants to keep duplicating their first album for ten years, but if you disagree, you can always try some Nickleback. i am not a current musician, but i played several instruments for nearly a decade in my adolescence. (i also can read music and – at one point – music theory, but i’m sure you’ll discredit me that i’m assuming other musicians can do so too and that i hold them to that, which i dont.) i also publicly discuss this and question it in relation to my criticism of music in other pieces i’ve written here. me holding The Strokes ‘responsible’ for Is This It is just my comparison. and before i started writing this i collected press from a lot of outlets who also discussed The Strokes’ discography as a narrative of the band – which is, in fact, how most people discuss a new record of a returning band. or any band. but particularly for a band like The Strokes who have had an impact on so many moving parts of our culture. we/i can not help comparing them. it is the nature of reviewing a new record. i know bands won’t make music forever. even The Beatles broke up. i wish some bands would stop so i could savor their flavor. and i wish others would continue, but that is life. is it better to burn out than to fade away? or is it better to realize your peak and give up because you know your heart isn’t in it anymore? 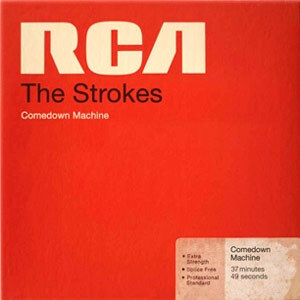 Comedown Machine is a great record. but it was also made to fulfill a contract. we are lucky that an obligation came out the way this did. i don’t think we’ll see any more Strokes records. but that’s just me.